If you’ve ever thought about decluttering and then stopped, or actually started decluttering and then stopped, you might find some aha moments below. Think about these words the next time you shuffle ‘stuff’ from one room to another, dust a vase with no flowers, spend an entire weekend at Costco or Target, or try to fit into a pair of jeans that will not zip, and haven’t in five years. Depending on where you are in your be more with less journey, you have either said some of these things, or will say them soon. This may sound similar to the 5 stages of grief, but it is in no way meant to diminish grief or other emotions. Let’s look through the sale flyers. I’m saving that for my kids. I need to get organized. I’ll keep that just in case. I spent so much on that. I’ve never worn it and the tags are still on. The collection company has me on speed dial. I work so hard to have nice things. I need some good Rubbermaid containers. We need a bigger place. Storage space isn’t that expensive…. I don’t even remember what was in that box. We may need to consider a smaller space. What else can we give away? Do we really need more than one? She won’t even notice it’s gone. What else can I get rid of? We are now able to downsize! Anything sound familiar? Embrace whatever stage of decluttering you are in and celebrate your accomplishments. You are doing great! I’m afraid I’ll have to buy it again. Face this fear by looking at what you use on a daily basis. Most likely, you own much more than you actually use. If you do need to use a special gardening tool once in a blue moon, borrow it or buy it when you need it. Don’t save it “just in case”. You might also keep multiples of things because you are afraid you will lose the one you use. Trust yourself to take care of a few pens, or spoons, or lipsticks and replace when you need to. Even better, try to use just one. I’m afraid that if I let go of something sentimental that I will forget the memory. Your memories and the people you love are not in your stuff. That said, if something brings back fond memories, take a picture of it, frame it and put it on your wall. This way you can share your memory instead of stuffing it in a box, because you don’t have a place for it. I’m afraid my stuff won’t go to the right place. 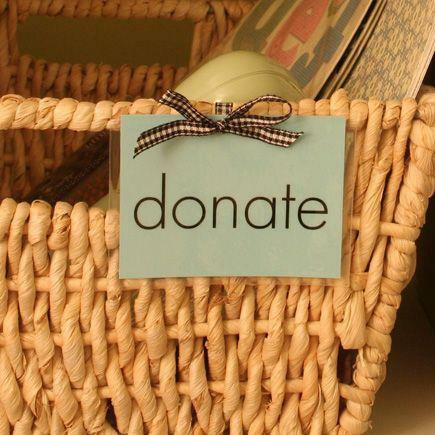 You can make sure that your stuff is appreciated when you let it go by donating it to people ororganizations. 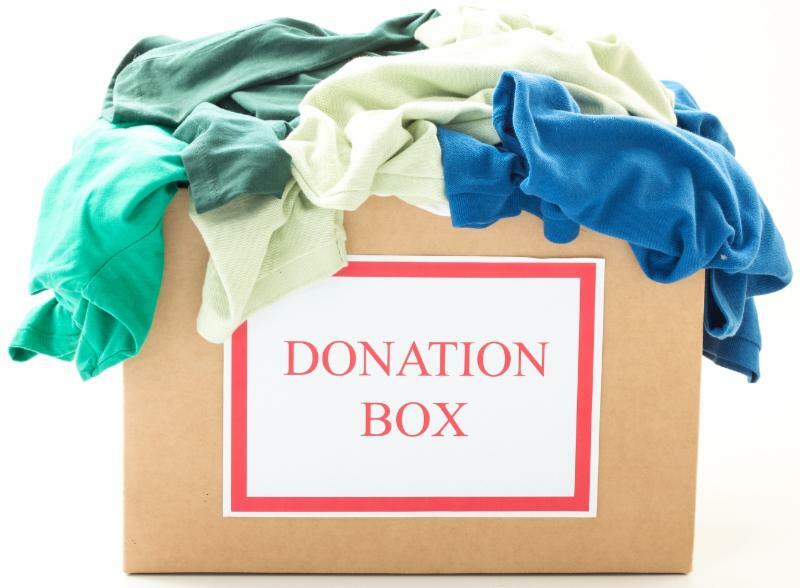 Donate clothing to a homeless shelter. Donate books to a hospital, school or retirement home. Place larger items on Craigslist or other classified sites. Recycle items when you can. I’m afraid I won’t have anything left to give my children. All your children will want from you is your love. Give them peace of mind and loving support instead of the responsibility of taking care of your stuff. If they are older, ask them if they want anything. If they say no, don’t be hurt. They love you, not your stuff. I’m afraid getting rid of my stuff will take a lot of work. It will take work and effort, but what it will pay you back in time and energy will make you wonder why you didn’t do it sooner. I’m afraid people will think I am weird or ungrateful because I keep giving things way. Some people will think that. Some people thought you were weird or ungrateful before. 😉 It’s not your job to please everyone. It’s not your job to convince everyone that you are doing the right thing. Lead by example. 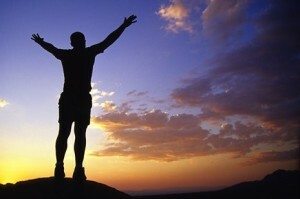 Let your happiness and kindness demonstrate that you are living your life just as you should. I’m afraid that I wasted money on things and giving stuff away is like money down the drain.That may be a harsh reality but holding onto those things, and continuing to spend money, time and energy on them is only perpetuating the fear and guilt. Let it go, and think more carefully about your purchases moving forward. There are so many things to be afraid of when you are decluttering, but even more ways to overcome your fear and live a clutter-free life dedicated to people and experiences instead of stuff and debt. 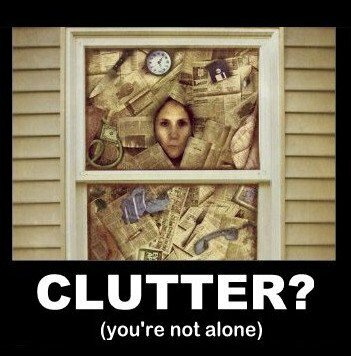 If you want help busting your clutter fears, we’re a phone call or email away. Weekly Quick Tips – Want to Live Longer? You Can! It’s a Benefit to Being Organized! Want to Live Longer? You Can! It’s a Benefit to Being Organized! So how else can being organized affect your health and wellness, if living longer isn’t enough to convince you? Being organized reduces stress: Stress is widely known as one of the major contributors to chronic disease. The subtle and not-so-subtle ripple effects of stress affect your physical health, relationships, and ability to be productive in the workplace. When you eliminate oppressive clutter, you feel more in control and better able to handle the challenges that life lobs your way. You are able to act more proactively rather than reactively so that you can work more productively and make the most of the time that you are given. Being organized boosts energy: Oppressive surroundings that are constantly in disarray can make one feel sluggish and unmotivated. You may feel confused, scattered, and unable to prioritize your activities. This constant state of psychological arousal is exhausting. When your environment is organized and free from clutter, you feel lighter of being and more able to focus on more meaningful activities and goals. Being organized can help you lose weight: Statistics show that people consume 50% more calories, fat and sodium when they eat out than when they cook at home. When you have a clean pantry, organized kitchen, and free time in your schedule, you are better able to budget time to find recipes, do the grocery shopping and prepare a meal plan for the week. Being organized can improve your relationships: Aside from the strain that one partner’s physical clutter can put on a romantic relationship, lack of time management and inability to can also negatively affect relationships with friends, family, and co-workers. Chronic lateness and missed appointments fosters frustration and resentment. Being organized can help you get more sleep: If you are disorganized, you may feel that the best way to get more out of your day is to cut back on sleep. Bad idea! 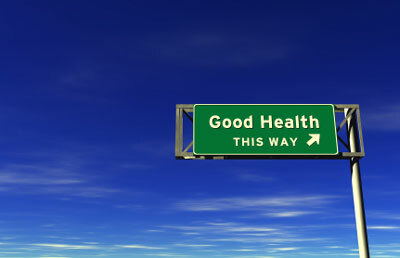 The number one thing you can do to improve your health is to make sure that you get 7.5-9 hours of sleep per night. The quality and quantity of your sleep directly affects your emotional balance, productivity, and physical vitality. Enjoying leisure activities, like painting class, is positively linked with health and wellbeing, according to a 2011 study at the University of Ottawa. But if you can’t cram one more thing into your schedule, you may want to get organized. Every minute you spend running last-minute errands or locating your keys, means less time to take up a new hobby or relax with a cup of tea. And activities that reduce your stress and add to your happiness contribute tremendously to your mental and physical health. The following is an edited excert from Reduce Resize REVIVE ~ The Upside to Downsizing. While written for the senior market and their adult children, this chapter is an essential read for anyone dealing with ‘stuff’. Click here to order your copy. We spend the first forty years of our lives enthusiastically accumulating stuff and the next forty trying desperately to get rid of the excess. As young adults we start out with old essays and cute stuffed animals. We quickly acquire cast-off furniture and household accessories donated by family and friends, gratefully accepting anything free. Weddings generate gifts, often in multiples; sometimes items we didn’t even realize existed. Once we have a place to live we head to our stores of choice, buying everything we’ve been told we must have. And we keep on accumulating until, one day, we realize that we have been buried alive, that too much of our time is spent managing stuff or just trying to find it. It may not be until a major life change or transition happens that forces us to take action against our stuff. Our relationship with stuff is like any other relationship; it must be managed and maintained. 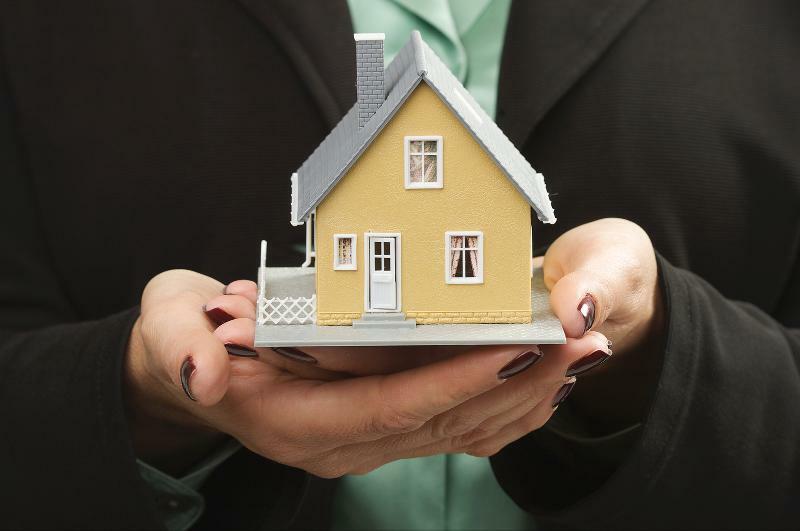 Newly married, beginning a family or as a new homeowner, you love your life, your home, and all your pretty things. You can’t imagine feeling otherwise. Middle age sets in, and then one day something shifts, and you realize that your relationship with your stuff just isn’t the same anymore. When this happens you have a few options to consider: you can settle and live in a dysfunctional relationship with your stuff for the rest of your life. You can unload it, remodel it, or replace it with new stuff. Or, you can downsize and break up with stuff altogether. It is the desire to live an unencumbered life that many empty nesters and seniors are finding harder and harder to ignore. But, unencumbered is tough if you are, like most of us, freighted down with stuff. The larger your living space, the more you accumulate. And yet, while organizing and throwing things out is hard enough, downsizing is a far more difficult challenge. People’s emotions lie in those boxes of photographs, old clothes and cherished gifts. 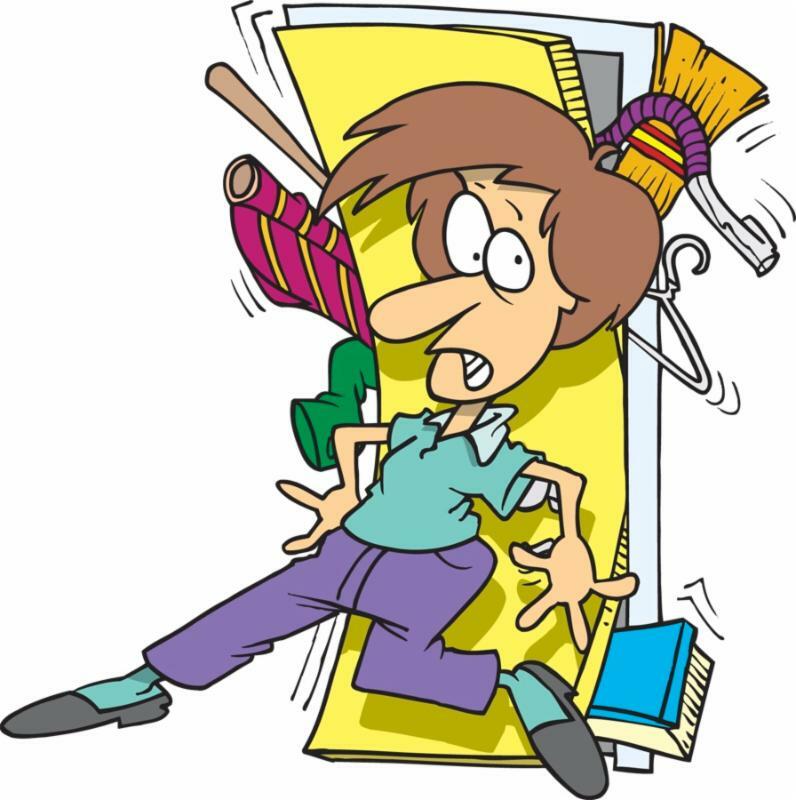 Clearing away clutter and distributing possessions is an emotional wrench and can be overwhelming. Bigger isn’t always better. There is a pervasive prejudice in our culture that more is preferable. That building up is preferable to scaling down. It is the same mentality that assumes that moving to a smaller place is a step downward, that having fewer luxuries makes you appear less successful as a person. The other thing to recognize is that scaling down does not mean renouncing your own style. It is actually a heightening of focus on the things you love and that reflect your essence. 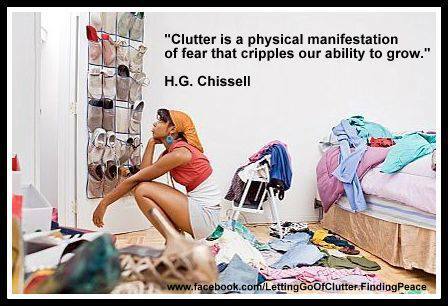 It means stripping away the clutter of what no longer fits or does not contribute to making your life easier. The sense of ‘home’ has nothing to do with its size and the sense of ‘feeling at home’ has nothing to do with the amount of stuff we accumulate. In fact, the ability to purchase whatever we want becomes a huge obstacle to understanding what really matters. In anticipation of a fresh start, one middle-aged woman living in New York held a massive auction on eBay and sold off virtually all of her stuff. She longed for the liberating feeling of unloading all of the stuff that she had been carting around for 30 years. ‘I didn’t need it, didn’t use it, I just had it all,’ she told cbstv.com. In fact, living this way, our stuff has us. When Mother Teresa died, the media reported that she left behind only a bed, a chair and a blue sweater. How wonderful to be so focused, to have only what you need and nothing more! Moving into a smaller space unencumbered with stuff is a wonderful time to re-evaluate your lifestyle and redesign it to who you are now and how you desire to live, relax and entertain. If you still have misgivings about moving into what seems to be a confining space, try thinking of it as an investment in time, not in place. 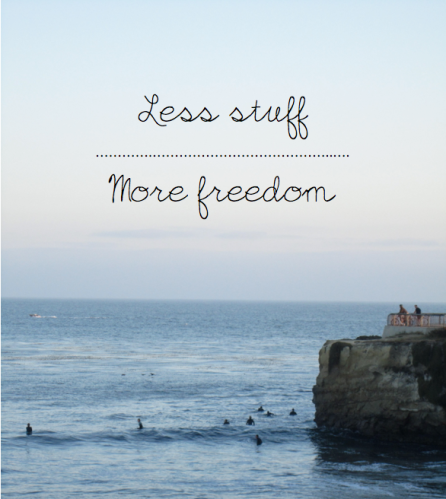 The more we get rid of clutter and its’ maintenance, the more we gain in time ~ our one truly non-renewable resource. Summer’s here and school’s almost out: For many, that means it’s time to take to the road! Family vacation travel can be enriching, enjoyable and exciting–but only if you’re organized. The family that fails to plan for summer travel can end up frazzled, frustrated and longing for the quiet comfort of home. Whether it’s a new divider in a household notebook or family planner, a dedicated section in a paper planner, or a vacation category in your handheld organizer, keep all travel information in a single location. Include contact information for airlines, car rental agencies and travel agents, passport and frequent flyer numbers, and itineraries. The three most important factors for vacation planning? Lists, lists and more lists! Vacation lists can include personal packing lists for each family member, a “before we leave” checklist, instructions for house-sitters, packing checklist, picnic planner checklist or camping checklist. Enter the packing zone. As you plan and prepare, set aside an area to gather travel essentials. In addition to tickets, passports, and travel documents, add travel-sized toiletries, tissues, travel appliances and personal care items. Moving from “list” to “packed” is easier if all your gear can be viewed in one place. Lighten the load. When traveling, less is more. For each family member, lay out all clothing and personal care items needed for the trip. Remove half before you pack the rest. Really. Investigate packing organizers. Pack clothing, socks, underwear and personal items in zipper food storage bags to cut wrinkles, protect clothing, and organize suitcases. Commercial organizers can be worth the cost for frequent travelers. Check them out! Pack for children day-by-day. For easiest travel with kids, use large zipper food storage bags to pack a complete outfit for a single day. Tuck dirty clothing into the same bag at day’s end. Forget what your mother told you, and pack your oldest underthings! When travelling, wear and toss. You’ll lighten the load and make room for souvenirs as you go. Plan for t-shirts. Vacations mean t-shirts, t-shirts, t-shirts! Deliberately under-pack, knowing you’ll add these garments along the way. Take care of yourself! Put together personal care kits for each family member in a zipper bag or cosmetics organizer. Include sample-sized bottles of shampoo, shower gel, lotion and sunblock. 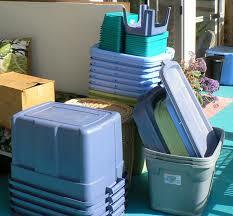 Use motel supplies along the way to replenish care kits. At vacations’s end, restock care kits and store inside suitcases for the next trip. Getting organizing for family travel doesn’t end when you walk out the front door. Try these strategies to keep the time on the road rolling….smoothly. Pack the snacks! Airlines have cut back on meal and snack service, while roadside ‘treats’ can be expensive and nutritionally void. Carry a small collapsible insulated bag and include a selection of healthy snacks. Keep the customers satisfied! A visit to the Dollar Store can go a long way to amuse children while travelling. For maximum impact, package small toys, books, and games separately and dole them out one at a time. Curb the ‘can we buy something’ clamor in every store. Create a ‘souvenir budget’; using an envelope for each child, deposit a pre-determined a amount of cash earmarked for souvenirs at the beginning of the trip. Your child can spend the money anyway he or she chooses. When they control the cash, children will become savvy souvenir shoppers! Not purchasing souvenirs that gather dust. Buy a t-shirt or something that you can use instead. Buying a consumable product unique to that country. Buying a Christmas ornament, and each year when you trim your tree you’ll remember your visit. Repeating the above for family members and friends ~ don’t add to their ‘collections’. Only printing photos that you will put into an album or scrapbook ~ no more loose photos floating around the house! Displaying your vacation photos in a digital frame that scrolls to a different picture every few seconds. If an object isn’t taking up valuable space and gathering dust, if it lights you up and is organized, then it really can enrich your home and bring back great memories! Enjoy your vacation!